Update – For recent updates on this building: see all pages tagged White Swan. This page was written a few years ago and is mainly a history of happenings (or lack of them) during the recent decades of closure. This building is locally famous for being empty for as long as anyone can remember. It may also have the honour of being the most regularly complained about building in letters to the local paper. Every now and then, over the years, there’ll be a letter to the Press asking who owns the White Swan Hotel in Piccadilly, why is it still empty, why can’t the council do anything, etc. So much has changed around it, with so many new developments, redevelopments, apartments, and the White Swan just sits there in the middle of it all, with its boarded-up frontage, resolutely refusing to alter, its cheap plastic signage fading. It’s only about a hundred years old, dating from 1912, but it looks older because of that black and white timbering thing going on at first-floor level. There was a much older White Swan Hotel here, an old coaching inn, facing onto Pavement, but it was pulled down in order to create this part of Piccadilly and get a through road down to Fishergate. Photos taken by the authorities before the demolition show some proper medieval frontages where there’s now the road. It was briefly occupied by squatters, in 2003, who had a creative response to what many see as a ‘wasted’ building, by not only living in it but tidying it up, renaming it the Rainbow Peace Hotel, and inviting the public to view it, in an ‘Open Day’ event. 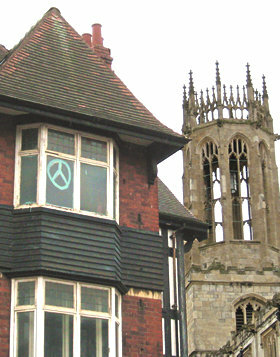 The peace symbols and other graffiti on the upstairs windows presumably date from that period of occupation. They’re rather faded now – they were brighter when I took a photo back in 2004. 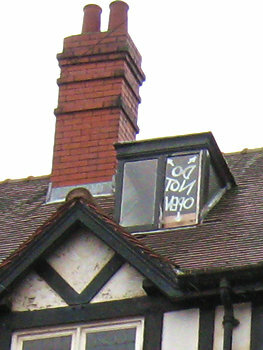 High up, in a window at the top of the building, ‘DO NOT OPEN’, painted on the glass. I assume this isn’t some kind of reminder/instruction painted there by the previous owners for the present owners, and referring to the whole hotel, but that it just refers to the window. Maybe someone did try to open it, and found perhaps that it was no longer attached to the hinges. The place is no doubt suffering a bit from lack of maintenance. There’s no lack of interest in it though. I know from my Google search stats that the web page on this site with photos of the building in 2004 gets a lot of hits – there are many people Googling ‘White Swan Piccadilly’, and the old ‘who owns ….’ question comes up every now and then. Other than that, not much has occurred of interest as far as I’m aware, since the ‘Rainbow Peace Hotel’, apart from one incident when a bit of the building fell off and nearly hit a woman who was walking by. The floorboard repairs of two years earlier obviously weren’t extensive enough. And isn’t it a mad world. Some people have no roof over their heads, and are sleeping rough in the middle of winter, while other people have massive buildings they can’t look after and leave boarded up. This hotel has 50 rooms, apparently. It was declared unfit for human habitation in 1992. In a different age, wealthy owners of a building like this, if they didn’t need it themselves, might have donated it to be used by those needing shelter, or sold it at a fair price to a local authority. Instead they’ve let it sit there rotting for decades. 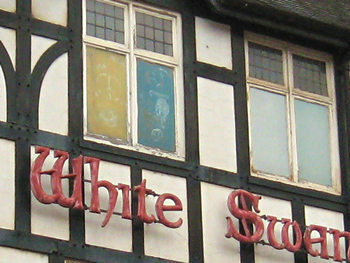 Ugly duckling to hatch firms – February 2006: ‘The owners are determined to do something about The White Swan’. Presumably referring to the bit of floorboard they got fixed. 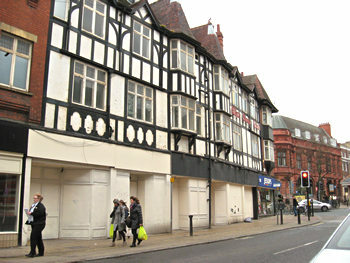 In 2011: according to recent press coverage, the owners of the building now have definite plans to redevelop the site. This has prompted many letters to The Press suggesting the facade should be kept. In 2012: plans were submitted in September 2012 for the refurbishment and redevelopment of the building. In late 2013: work began on the renovation and redevelopment of the building. It ids sad that such a nice hotel is empty! Dave Riley RIP was bar manager in the Mid ’70s. A good young crowd went in the “Centre Bar”. Huge picture of a Cord car on the back wall. Happy days! Dave was after my time. I was asst manager under Dave Cookson (manager) in 1971-72. Claim to fame, banned NUM leader Arthur Scargill from the bar due to power cuts caused by the NUM! My mum, Irene Mary Morgan /Frost was listed as a Chambermaid at the hotel in Sep 1939. The hotel proprietors were Solly & Ellen M. Morris.